Sri Krishna Gana Sabha is one of the well-established, most respected and dynamic cultural institutions in India today. Since the Sabha’s beginning in 1953, it has played host to some of the greatest exponents of Indian classical music, and Indian classical dance. The Sabha has displayed a deep commitment to the advancement of academic research in the classical arts through the various successful conferences and discussions it hosts throughout the year. In July of 2016, I had a great opportunity to perform here with Kalyani (an amazing dancer and wonderful friend). Looking back, the preparation for the performance was a lot of fun, because the two of us had a great time practicing and coordinating together. 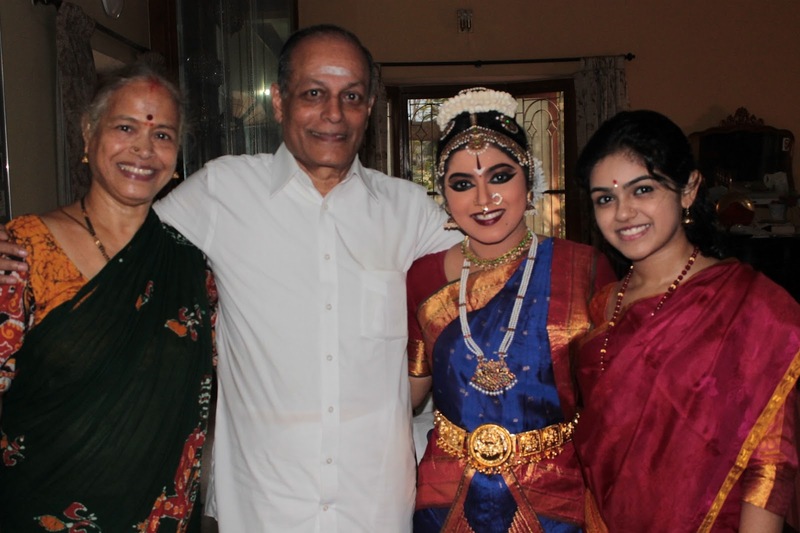 The constant encouragement from Sundaram Mama, Gomathi Mami, Nithya Mami, and Savithri Mami helped both of us get through the stress and pre-performance nerves. Not to mention, my dear friend Kalyani helped me so much throughout the entire process, and we became exceedingly close over the course of the trip. Ultimately, I'm extremely thankful to Sundaram Mama for the opportunity, and the entire experience will remain close to my heart forever. Thanks to technology we now have access to good performances more so of young talent available easily. For young dancers.. it means that they can now reach larger audience from around the world making it easy to get recognition. 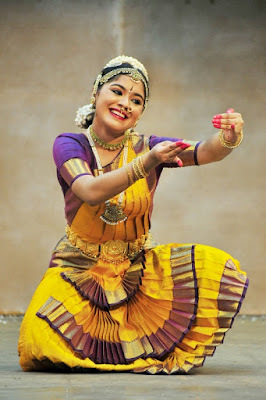 I had the opportunity to view a Bharatanatyam Arangetram - 15th August 2015 performed in Indiana, by young Jwala. She is the disciple of Smt Mangala Anand. About Guru: Smt Mangala Anand trained under Smt. Padmini Ramachandran (Natyapriya Institute- Bangalore who learnt from veteran Guru. Padmashri. Vazhuvoor Ramaiah Pillai) and from Guru B Bhanumati (who had the privilege of the tutelage of Padmashri K.N.Dandayuthapani Pillai at Chennai, Padmabhushan Dr.K.Venkatalakshamma, the doyen of Mysore Palace tradition and Padmabhushan Smt. Kalanidhi Narayanan). Here is a report on the abhinaya items of the margam in the arangetram. The items were choreographed by her Guru and consisted Varnam, a Sabdam and a Devarnama in the margam following the invocation and nritta items. Young dancers take to the high energy and pace of the nritta items of the margam with comfort and alacrity. Past the nritta items, the weave of the emotion is what is eagerly awaited in the margam. 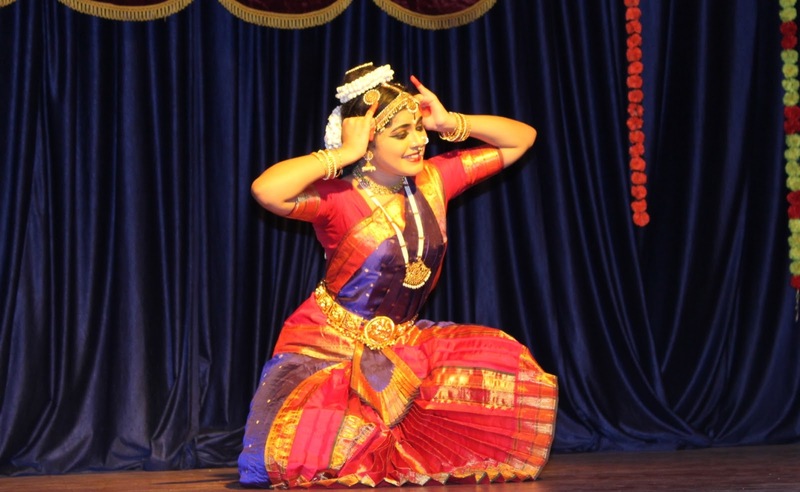 Interpretation behind the abhinaya items helps us to appreciate the performance a lot better. There is an added advantage where the choreographer happens to be the Guru as the explanation is conveyed to the disciple first hand. 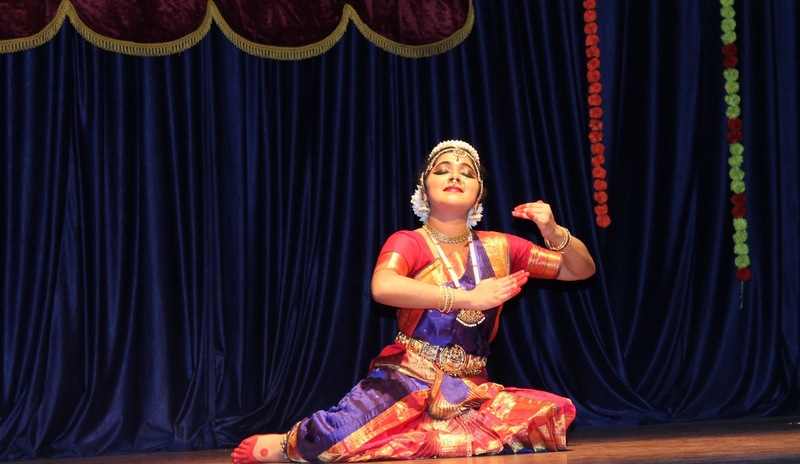 In her performance Jwala steadily graduated through abhinaya and showed her understanding of the lyrics, musical notes. The jathis smoothly flowed perhaps owing to the lineage of the Gurus style. Smiling face of Jwala was lighting them all through. The romantic elements unfurled in the sabdam and varnam. The intensity of Thillai Ambalam requires elevated expression where the Nayika is in a state of wonder, praise and devotion and very intense in her seeking of her Lord. The anxiety and lingering doubt whether she would at all meet Him make the expression challenging. She is all searching for her Lord and conveys the same to her Sakhi in the very abode of Lord Nataraja, in Chidambaram. Jwala's performance to the choreography was neat. Note the prominence given to dance in this lyric! The young dancer took to the varnam with more ease. In the "Sakhiye.." Jwala's portrayal of the nayika is one of involvement. Her Guru's training in the delicate portrayal, and distinctness are visible. It's the dancer who opens the doors of the choreographic content and to its expressive interpretation. In this item Sakhiye... the nayika finds in her friend an ideal confidante, to at first share her feelings about her lover, then seek help from her in a pleasing manner and finally opening her heart and appealing to her friend to bring her nayaka to her. The devotion and complete faith in the Lord conveyed by the lyricist need special note. The dancer's talent lies in depicting the nayika through the gradual ascension and intensity of this feeling through the item. With her smiling face Jwala initiates the item at first chiding her sakhi about the delay, then describes her generous Lord and convinces her sakhi to take up the task of uniting her with the nayaka. The depiction of Sri Venkateswars, Lord Rama, and Lord Krishna, stand out. Sri Purandaradasa's weave of a beautiful incident between Yasoda and Krishna is found in this devotional item. Created with crisp choreography it makes you feel a mother's love to her supreme naughty child. The item starts with the episode of Krishna stealing butter. Yasoda confronts him while in that act. as he pleads to melt her heart... Jwala becomes Yasoda who introduces Gumma the imaginary demon to control the mischief supreme, Lord Krishna. The ragamalika was rendered beautifully to moving moments of Krishnaleela and to Yasoda's predicament. Jwala depicts both roles distinguishing them skillfully. Her portrayal of Krishna is very impressive. We are blessed with such a divine lyric from Purandaradasa, and being dancers even more fortunate to enact it. Through the above abhinaya items, Jwala performed an intense seeker of Lord Shiva wondering and in awe to a Nayika who comes out confident about her Nayaka, Lord Vishnu, and a mother who with all love and affection disciplines her dear son Krishna. Quite an expansive range of emotions she displayed and so much for her to explore in the beautiful dance form Bharatanatyam. Looking forward to watch her performances. 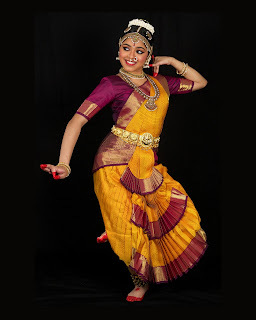 It is interesting to note that in some of the performances of dancers abroad, a similar depth in the emotional portrayal is found as in dancers from India. One reason, as in this performance, is perhaps a continuing Guru Shishya Parampara. 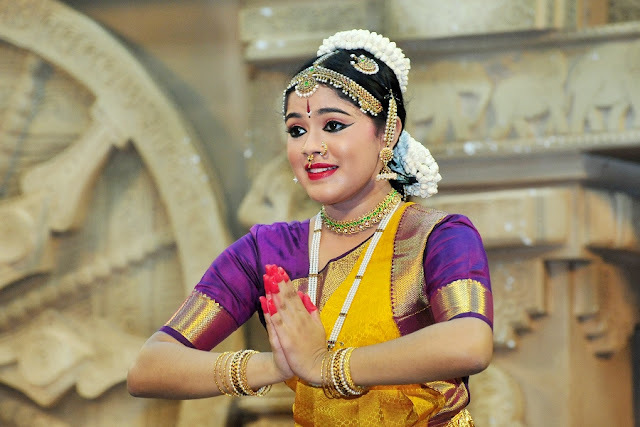 The connect to culture and traditions of the younger generation is intact in India or abroad. Congratulations to Jwala and her supporting artists. Here are some pictures of my solo performance at T N Rajarathinam Pillai auditorium on 31st December 2015. Thanks to Sri. Sundaram mama and Cleveland Thyagaraja Aradhana. This performance was organized as part of Cleveland festival. Also thanks to all the friends and well wishers who attended and encouraged me on that day.